The Field Service Technician is a very special person in the Genie organization. There were many instances where the Genie technicians went well above and beyond the call of duty to assist customers. While many of us feel that weekends and nights are sacrosanct, Genie Field Service Technicians willingly give up their private time to help out and support Genie customers. To launch the year-long program in Australia, Genie’s Field Service Technicians from all Australian branches attended a series of service specific briefings and presentations on the Gold Coast. 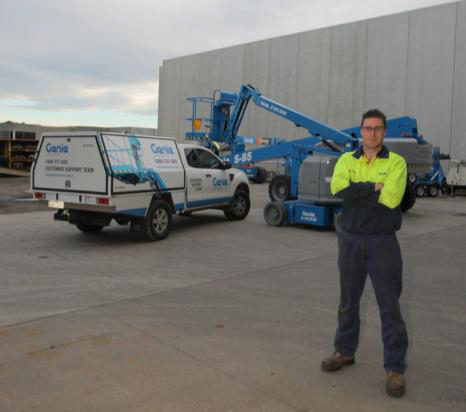 Fearon was in Australia and actively participated in the presentation which coincided with the May launch of the Genie® SX-180 boom lift, and the Genie Customer Appreciation Night at Hire & Rental Industry Association Convention, HIRE14. Fearon outlined the global strategy to the group and the place that service holds in providing the best aftermarket support. His key message that “Sales sells the first, but service sells the rest” left a lasting impression in the minds of everyone present. To fly in and have a meeting with all of the Genie Field Service Technicians demonstrated a high level of investment in time and genuine commitment to service excellence.